The Mill Valley Chamber Music Society continues its 40th Anniversary season presenting the Escher String Quartet. The New York-based Escher String Quartet has received acclaim for its individual sound, inspired artistic decisions and unique cohesiveness. In June 2013, Rian Evans, for The Guardian described the Escher String Quartet as "clearly one of the finest quartets of their generation." Robert Battey of The Washington Post proclaimed Escher as "one of the top young quartets before the public today...This is a group to watch." 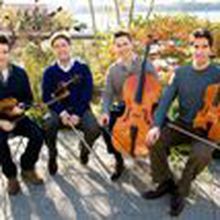 Recently honored as a recipient of the 2013 Avery Fisher Career Grant, the Escher String Quartet (featuring Adam Barnett-Hart, violin; Aaron Boyd, violin; Pierre Lapointe, viola and Dane Johansen, cello) performs a program featuring Schumann: Quartet, a minor, op. 41 #1; Berg: Quartet, op. 3; and Dvorak Quartet, C, Op. 61.